We really don’t think we could name someone who doesn’t love chips. 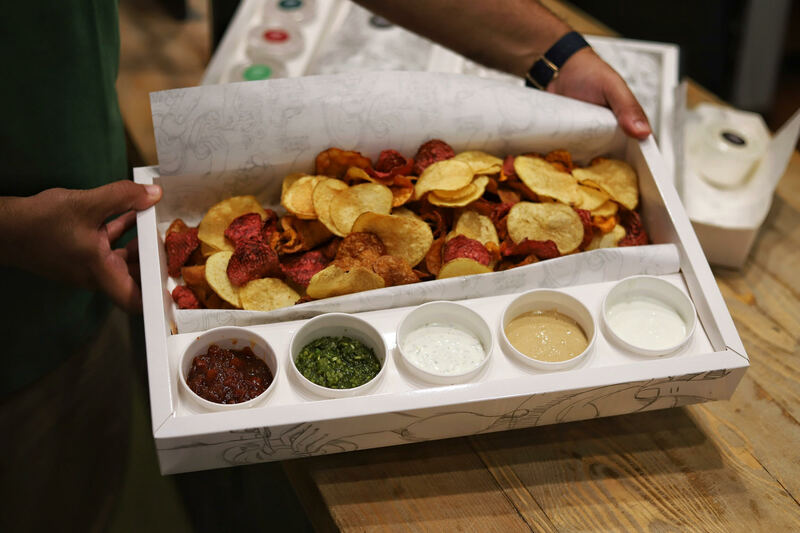 What if we told you that now you can have homemade chips, with a wide selection of dips, at the newly opened Soul. Soul has a pretty cool location inside Galleria40’s Zaitouna Food Hall, which is right next to the kid’s area, making it the perfect snack for mommies (or daddies) and their kids. Their black and white theme is quite simple yet perfectly executed. We are also in love with their packaging and the appearance of their menu. There are four options of chips, with three sizes, and loads and loads of dips to pick from. Instead of picking potato chips or sweet potato chips, we went with a “To Share” sized Mixed Veggies serving of chips (175 LE) which was served with 5 dips of our choice. For our dessert, we went with the large-sized Green Apple Chips (220 LE) that comes with three dips. The mixed veggies box consisted of four kinds of chips; potato, carrot, beetroot, and sweet potato. The chips were all well-prepared and far from oily, and well-seasoned overall. The potato and beetroot were definitely crispier than the carrot and sweet potato chips. We also have to say that this dish is ideal for sharing. As for the dips, it took us a long time to select them, but we ended up choosing the tomato chutney, the wasabi cream, the dill and green onion, the pickled lemon tahini, and the walnut pesto, out of the total of 14 dips that were available. We loved the sweetness and chunky consistency of the tomato chutney but it was much too chunky for the chips. Meanwhile, we loved how the wasabi cream didn’t have that burning aftertaste you often get while eating wasabi with sushi. In fact, we found it to be a pretty cool dip that went perfectly with the sweet potato chips. As for the dill and green onion dip, it was bursting with herby flavours and just felt homey and familiar. The tahini, on the other hand, was quite stiff in texture and we couldn’t taste the presence of the pickled lemon at all. Our personal favourite would have to be the walnut pesto as it was bursting with garlicky and herby flavours which went well with all the chips. Moving to dessert, they exceeded our expectations with a simple masterpiece; green apple chips tossed in a cinnamon sugar mix, and three dips. The chips were slightly thick, yet very crispy, and it went really well with the Nutella dip and the white chocolate dip. 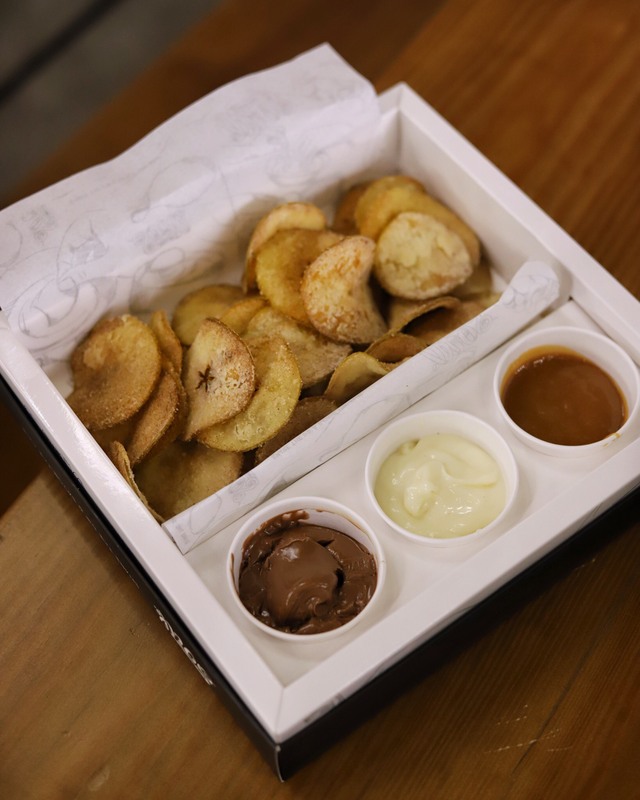 As for the third dip, the not so “salted” caramel, well let’s just say that it proved to be the ideal dipping partner for the green apple chips; it was a match made in heaven! The green apple chips were flawless.